After my journey through Russia I hit the road to Estonia. 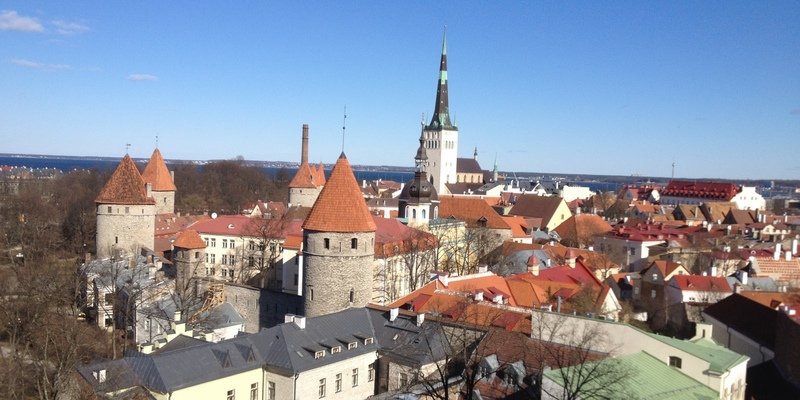 Here I spent a few days in the capital Tallinn. 340,000 people live here and that´s almost a third of the population of Estonia. Without great expectations we got to the city early in the morning. Before, we had experienced higher temperatures in Russia; compared to that it was unusually cold in Tallinn. Fortunately, I had packed my favorite warm sweater as a precaution and it was keeping me warm on my way to the hostel. The city Tallinn is quite easy to survey and stands out due to the original appearance. Especially the city walls, the Nikolai Church, the place of parliament on Toompea (Cathedral Hill) or the House of the Blackheads enchant visitors with the history of the city. Surprisingly, the city seems to be particularly popular for medieval fans who meet here and follow their passion at the city walls. However, I am more interested in the incredibly fascinating colorful, original doors which you can see at many houses. The town is quite small. Moscow and St. Petersburg have had this incredible size and decadence which you do not have in Tallinn. In my hostel there were travelers from the US, Australia and Europe. And their main interest is reduced to party in clubs and bars. So, while I take a look at the town and follow the exciting free walking tour, my roommates sleep and slowly recover from their hangover. We meet again in the evening and while they tell me their stories of the last Clubbing Night, I give tips for the most beautiful corners of the city- just in case- if they decide to explore Tallinn at day light before they leave the city. While the others are blissfully still in their beds, I get up early in the morning and go once again to the city walls on the observation deck from which I enjoy the nice view in the early morning and with a seagull sitting right next to me- also enjoying the view over the Baltic sea. In a few hours I will take the ferry to Helsinki. It is very wonderful places post in Travel Diary that’s very cool place in your sites. You match the SKY!! How cool is that? And what a beautiful, beautiful place.